Sustainable, environmentally friendly, resource-efficient business models as well as social aspects should be taken into account more when assessing manufacturers of photovoltaic modules in the future. The Silicon Valley Toxics Coalition (SVTC) is now looking to turn these principles into an American standard. The non-profit organisation, which is based in San Francisco, was founded in 1982 when highly toxic substances were found in the groundwater near high-tech companies in Silicon Valley. SVTC successfully introduced new legislation that made monitoring underground chemical tanks mandatory in the United States. Since then, SVTC has been working on rolling back the harmful effects on health and the environment of producing, using and distributing electronic products. Two of the tools that it uses to achieve this are its own scientific research and legal representation of affected persons. But SVTC isn't just scrutinising IT companies in Silicon Valley anymore. It has also been looking at the photovoltaic industry for quite some time now. In November 2014, SVTC started working on implementing the Scorecard as a national standard that fulfils the requirements of the American National Standards Institute (ANSI). This work should be completed by 2017. The organisation has now published its sixth Solar Scorecard www.solarscorecard.com . It ranks module manufacturers using a point system with twelve criteria on social, sustainable and environmentally friendly manufacturing. 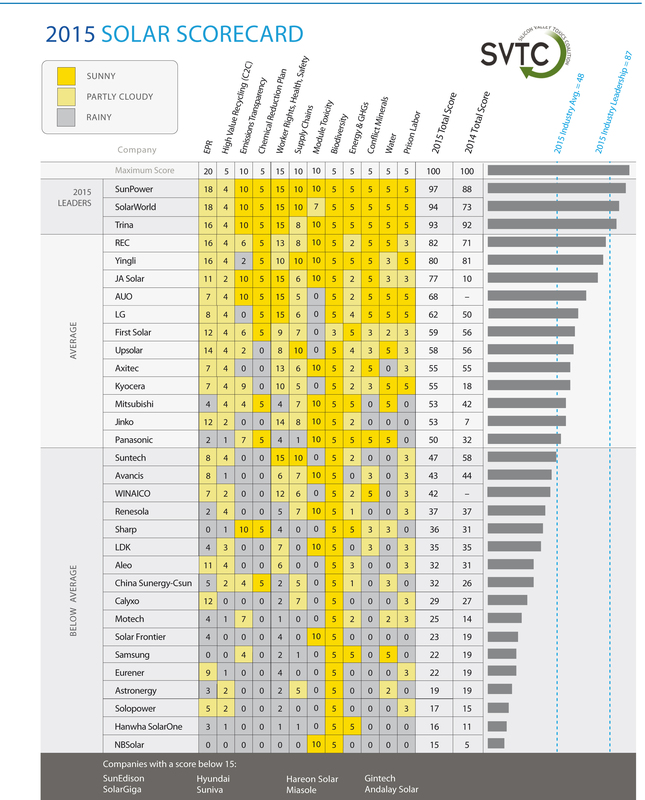 The Sixth Annual 2015 Solar Scorecard presents an index derived from these criteria for forty module manufacturers. Thirteen of the companies on the list provided information directly to SVTC. Publicly available sources were used for the others. "We need consistent industry-wide sustainability practices and reporting procedures that consumers can expect from all solar companies," said Sheila Davis, executive director of the Silicon Valley Toxics Coalition. The extent to which module manufacturers disclose information on the use of hazardous chemicals in their modules still varies widely: only six manufacturers (Trina, AUO, SunPower, SolarWorld, Sharp, and JA Solar) publish comprehensive lists on their websites. Sixteen companies also publish reports on individual categories such as toxic waste, heavy metals, air pollutants, and ozone-reducing substances. 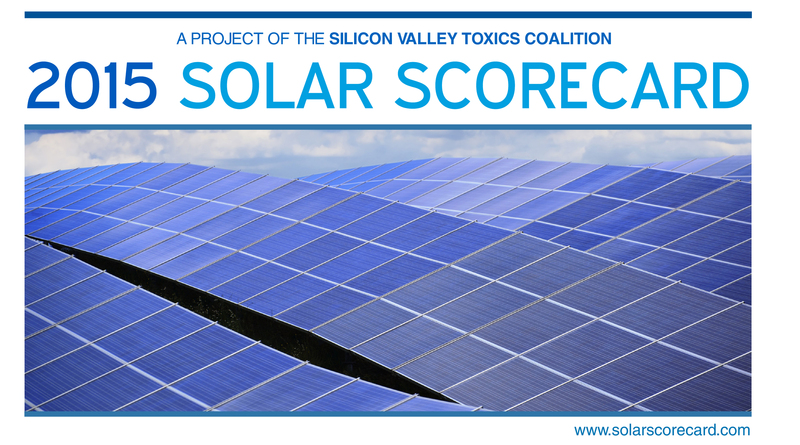 Associate Professor Dustin Mulvaney at the San Jose State University, who helped SVTC with interpreting the Solar Scorecard, emphasises that it is becoming increasingly commonplace for companies in other sectors of the semiconductor industry to publish this type of environmental data. In his view, the fact that six companies on the 'Top 10' list of module manufacturers are sharing their data with SVTC is a sign that the industry is becoming more mature.